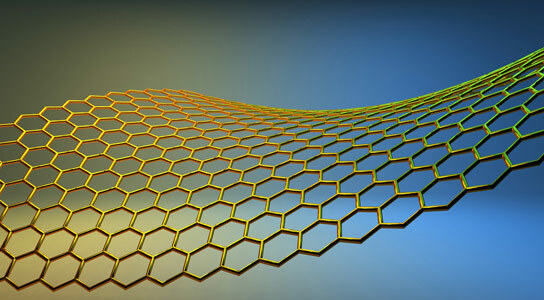 Researchers look at new ways to use graphene in telecommunications. Research from the Universities of Bath and Exeter suggests that the use of graphene in telecommunications could improve speeds by nearly a hundred times that of current materials. In a paper published in Physical Review Letters, researchers from the Center for Graphene Science at the Universities of Bath and Exeter have demonstrated for the first time incredibly short optical response rates using graphene, which could pave the way for a revolution in telecommunications. Every day large amounts of information is transmitted and processed through optoelectronic devices such as optical fibers, photodetectors and lasers. Signals are sent by photons at infrared wavelengths and processed using optical switches, which convert signals into a series of light pulses. Ordinarily optical switches respond at rate of a few picoseconds – around a trillionth of a second. Through this study physicists have observed the response rate of an optical switch using ‘few layer graphene’ to be around one hundred femtoseconds – nearly a hundred times quicker than current materials. Graphene is just one atom thick, but remarkably strong. Scientists have suggested that it would take an elephant, balanced on a pencil to break through a single sheet. Already dubbed a miracle material due to its strength, lightness, flexibility, conductivity and low cost, it could now enter the market to dramatically improve telecommunications. In the long term this research could also lead to the development of quantum cascade lasers based on graphene. Quantum cascade lasers are semiconductor lasers used in pollution monitoring, security and spectroscopy. Few-layer graphene could emerge as a unique platform for this interesting application. 3 Comments on "Graphene Could Make Telecommunication Speeds One Hundred Times Faster"
Nice, NanoCrystal storage and graphene, makes the super computer sound old. Faster Computers with unlimited storage. Now we need to find a way to use it wirelessly and be able to communicate at vast distances. Now we need those Space Engineers to crack light speed so we can shoot for the stars instead of the moon or mars. “Graphene is the only two-dimensional conducting membrane in nature,” said David Horsell from Exeter University, “it is optically transparent, strong, flexible, stretchable and impermeable.” No gas, not even helium, seeps through graphene. Interesting! Graphene has always a good benefits. But i am so amazed that Graphene can make telecommunication speeds faster than what we have expected. This is really a fantastic technology and i hope it will have a long time used!